The New Zealand Land Company - Whaling Trade - Free Church Association - Reports - Selection of First Ships. Incidents on the Voyages of Several of the Early Ships, together with an Account of the Voyage of the "Bengal Merchant," in 1839-40, to Wellington. Arrival of First Ships - Dunedin and Neighbourhood - Work Begun - Selections - First Houses - Work and Wages - Rural Lands - South and North - Law and Order - First Anniversary - General Notes. Incidents, Anecdotes, and General Descriptions compiled from Accounts of some Early Settlers. Church Matters, and some of the Early Ministers. Some of the Pioneer Women of Early Otago. The Early Settlement of Tokomairriro Plain. 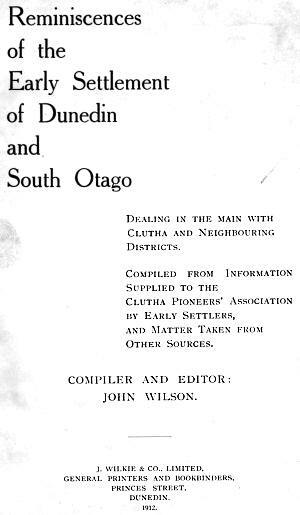 The Clutha (or Molyneux) District - Incidental - River Molyneux - Survey - European Settlers before Immigration - Willcher and Russell - Inch Clutha and North Side of Molyneux - Balclutha - South Molyneux, South Clutha, and Catlins. Wharepa from River Molyneux, Waitepeka - Kaihiky, Waiwera, and Onward - S.S. "Tuapeka" - Mails, &c. - Sports, Picnics, &c.
Religious and Educational Work in Clutha - South Clutha and Port Molyneux - Inch Clutha and Kaitangata - Balclutha - Wharepa - Kaihiku - Clinton and Waiweka. Agricultural Matters - Ploughing Matches. Incidental and Anecdotal - Wild Dogs and Wild Pigs. Discovery of Gold, and Incidents told by some Early Settlers. Great Floods in Clutha - First Visit of Sir George Grey to Clutha - The Brave old Pioneers. List of Early Selectors, with selections in and around Clutha, 1847 - 1859. 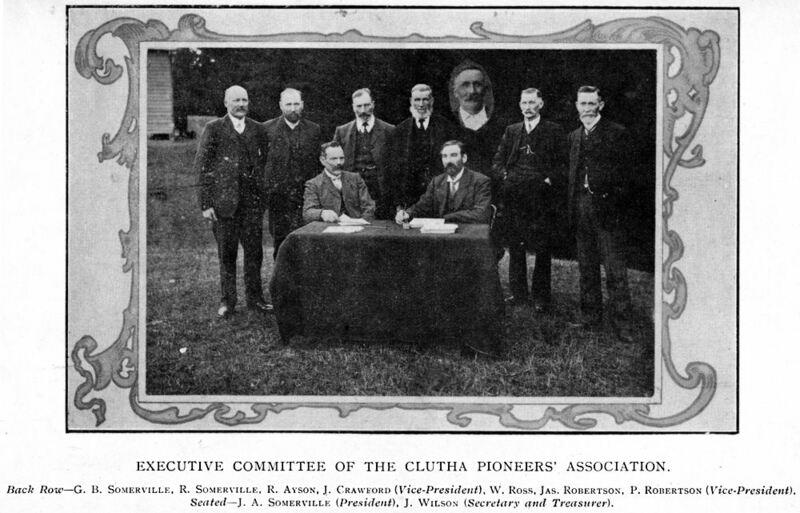 Biographical Sketches of some Early Settlers in and around Clutha.